For a number of years now Tony Fomison has been notable as a painter following a unique path: and as one who stands out because of the strength of his personal convictions about the direction that painting today should be taking. His is a romantic vision in an art-climate that places an almost obsessive emphasis on 'coolness' and 'intellectualism', usually within a formal abstract manner. In Fomison's recent one-man exhibition at the Barry Lett Galleries (July 27 to August 6) we saw many of the themes and concerns that we have come to associate with this very individual artistic personality. The exhibition, consisting mainly of oil paintings with a few of Fomison's strange drawings and two stone carvings, was important not only for the amount of work (fifty-four works from an artist whose working methods are slow), but also for the high quality of the exhibition as a whole. TONY FOMISON What Shall We Tell Them? The amount and quality of the new work could be seen to testify to the success of what seems to be a new approach by Fomison to the selection and choice of his subject matter. No longer do we find him, as in earlier paintings, relying so much on the almost chance discovery of photographs, illustrations or paintings that impinged on him as somehow being fit subject matter for his art. Fomison himself testifies to a new reliance on 'what his brushes tell him',(1) especially after long periods of soaking himself with the various themes within which he wants to make a statement, without as I have previously suggested feeling the necessity to utilise any actual motif drawn from a photographic or other source. Fomison's early background at the Canterbury Art School was mainly in sculpture: 'I was busy protecting the as yet unborn baby of my painting by doing sculpture. I was at art school and I didn't know I was being taught by the landscape. '(2) It was not until 1961 that Fomison began to paint. In 1963 he received an Arts Council Travel Grant to Europe where he travelled and lived for three years. During this time he did very little sustained work, mainly looking at paintings and sculpture. It was only when he was hospitalised at London's Banstead Hospital that he began to paint earnestly once again: significantly these paintings were copies after old masters that had impressed him. Repatriated in 1967 Fomison returned to Christchurch where he began work with a new-found sense of purpose. His work was first shown in Auckland in quantity in a one-man show at the New Vision Gallery in April 1972 and consisted of both new and old work, of his copies after the old masters, and of the new images that he derived from institution inmates and gurners amongst others. Given the above and Fomison's previous background in sculpture the emergence in this exhibition of two small carvings is of interest. The Three Prophets (1974-5) is a totemic work, imbued with the same rhythms that Gauguin found in his synthesis of art nouveau and Tahitian carving. Its primitive mythic quality is enhanced by the shallow relief carving, while its sense of completeness marks it as being far more successful than its fragmented fellow. Of prime interest, however, are the new paintings themselves. They have lost the 'stagey' look that I feel derived from Fomison's previous interest in photographic sources, an interest that seemed to mar some of the works in the 1972 New Vision show. Images were culled from medical text-books (see Study of a hand 1970, in a private collection, which is inscribed as being from 'pge. 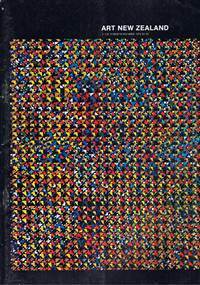 384 Roxburgh's Common Skin Diseases, 12 Edition 1961'). In this respect he can be likened to the British painter Francis Bacon, the tone of whose work Fomison's often parallels. like Bacon, Fomison has used the medical photograph as a sounding board for normalcy, the abnormal aspects giving the image a new edge. As is usual with Fomison's work the initial impression from this exhibition is one of monochromatic black and white: but in the new paintings closer inspection reveals a wider range of darks. Umbers, browns, blacks and even blues contrast with creams, greys and whites - all unified by Fomison's rugged chiaroscuro of glazes. A new complexity of colour is seen arising from a fresh confidence in his ability to handle paint. Where in this exhibition a theme is repeated from the previous show (as in the institution inmate idea of the figure behind bars) a new understatement appears. Comparison between the earlier An Institution Window (1971-2)(4) and the more recent Looking Out, Looking In (1976) shows the power that arises from a crisper technique, and from a clearer conception of his task as a painter. No longer is Fomison struggling with the problem of reproducing a painting (albeit in a highly personal manner); rather, the painting itself has a greater integrity as an invented image. The images themselves are part of the painter's inner world: prophets and pilgrims - those archetypal symbols of the search for self: old images, but firmly welded to a modern conception of man's continuing predicament. In plumbing these more direct images Fomison ranges over a wide variety of different subjects. Portrait heads are in profusion, given a new tension within the tight circular or diamond frames, their subjects ranging from visionary portraits of the painters Blake, Gainsborough, Rouault and Richard Dadd, to imaginary heads of jesters and Pierrots. 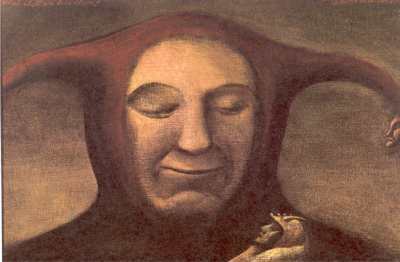 Fomison delves deeply into the mythology surrounding the fool-jester image, enlarging its already rich import to suit his own ends. The belled cap of the Fool is transmuted by the painter's alchemy into the multi-headed Hydra and Medusa figures - themselves the object of past mythological quests; while in other works it becomes the strange horned skull, the living helmet of the guardian figures. We can thus see that the true subject of Fomison's work, at least in the larger figure compositions, is this metaphysical journey: the sum result an 'icon concerned with human fate'. Fomison's work is rich in symbology. Take for example the painting A Warning to France whose Roofs will melt but hardly with love. A stage-like setting reminiscent of the sea-side Punch and Judy booth begins the complicated cross-referencing of symbols. The Punch figure (one that Fomison uses often in varying forms) parades resplendent in his cockerel helmet brandishing a wooden sword in 'Blimpish' fashion at an allegorical figure of French liberty. The work is a rich scenario of militarism and civil responsibility that perhaps reflects something of Mururoa in the 'melting roofs'. Via the printed word this sounds rather banal: but as a painting it is subtle and very successful, the structuring of the message relating very clearly to the English cartoon tradition of Rowlandson and Gilray. Fomison's art has in the past been primarily concerned with a central figure (sometimes only part of a figure), usually with the barest of environmental detail to locate it within the world. Rarely one found details such as bars or grills; more ordinarily the figure emerged from a primal darkness. More recently a landscape can be seen to be resolving behind the figures: the pessimistic fog is lifting and as part of his new confidence as a painter, the landscape becomes an integral part of the painting. There is even a delightful pure landscape in this exhibition - Last Light on the Estuary - an image of great romantic beauty. Visible as backdrops in several of the works are glimpses of Auckland's wild west coast beaches. Dark headlands and luminescent surf-spray become active participants in paintings that are otherwise often still. This is the landscape that imbues such paintings as The Pilgrim, illustrated here, and The Watcher on the Shore with a sense of mystery and oracular potency. Fomison's use of landscape directly relates to the sparse New Zealand landscape of hope and despair that Colin McCahon has already documented. Again, however, Fomison has entirely absorbed this usage to enlarge and deepen the drama of the landscape. Larger compositions have been appearing over recent months also: the Benson and Hedges entry, Let each decide, Yes let each decide, and in the recent show, Waiting for the Answer (an image similar in form to that in the painting illustrated here, The Question). I feel however that although these obviously represent one of Fomison's main interests as a painter it was these same works that seemed to contain the problems of technique that ultimately affect the over-all idea. For a painter such as Fomison with his technique of gradually building up layers of thin glazes the problem can occur over a large surface of keeping the paint itself interesting. Tension can be lost if the paint surface is a large area that is comparatively inactive. Waiting for the Answer has such problems; strong personal imagery is marred by large areas of dead paint: but this is a problem that the artist has resolved in the past. In the Study of Holbein's Dead Christ (1970-71), the strength of the image and the delicate handling of the paint prevents an amazingly long painting of almost ten feet from becoming fragmentary: and in fact is exactly what imbues it with its powerful hypnotic quality. In the smaller works no such problems are present and in paintings such as What shall we tell them?, we see one of this artist's most successful small works to date. Its richness of colour and depth of psychology endow the jester figure with a mythopoeic grandeur. Tony Fomison is now thirty-seven and has been steadily painting over the last ten years; so it should not be surprising that in a period of relative tranquillity his best work is beginning to appear: new images emerging from deep within, guided and informed by a fully-lived and involved life. 1. Conversations with the artist, July 1976. 2. A provincial artist talks of religious compassion, an interview by Denys Trussell in the Auckland City News, August 17, 1976. 3. This and subsequent works mentioned (unless otherwise indicated) are listed in the catalogue of the Tony Fomison one-man exhibition, Barry Lett Galleries, July 27 to August 6, 1976. 4. Illustrated in Artis, Vol. I, No.2, page 10, with an article by Michael Dunn, Tony Fomison: a consideration. 5. City News interview listed above.